Craving for some serious comfort food. 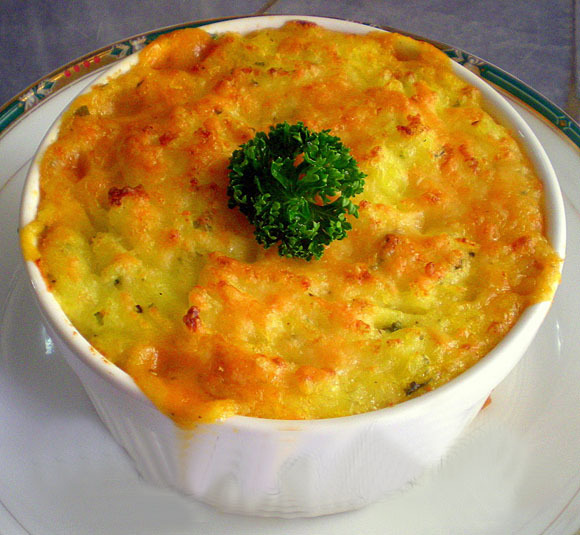 This Shepard's pie is rich and satisfying, and is sure to please. Cook potatoes in boiling salted water in a saucepan until tender, 12–15 minutes; drain. Return them to pan to dry over medium heat, about 1 minute; remove from heat. Mash potatoes with milk and butter; season with salt. Cool potatoes 5 minutes; stir in yolks. Drain meat in a colander or sieve. Sauté onion, mushrooms and carrot in oil in the sauté pan over medium heat 8 to 10 minutes.. Add garlic and tomato paste; cook 1 minute, stirring frequently. Stir in lamb or beef, Worcestershire; sauce season with salt and pepper. Pour lamb mixture into a 2- 3 qt. baking dish or you could use individual baking dishes, then top with mashed potatoes. Using a fork, spread the potato topping evenly over the meat mixture. The fork tines add interesting texture. Sprinkle the cheddar cheese evenly over the top of the mashed potatoes. Place dish on a foil-lined baking sheet in the center of the oven (will make cleaning easier if it bubbles over); bake until pie is bubbling and golden brown, 30–40 minutes. If you prefer, beef easily can be substituted for the lamb. For best results, use ground beef Sirloin. Add egg yolks only after potatoes have cooled slightly. Hot potatoes could curdle the yolks.